The Kiechler Law Firm understands that times are rough. When you think times are getting better, the unthinkable happens: you get injured, it is not your fault, you are incapable of working, and you know medical bills are going to be expensive. Whether you were in a car accident or injured by a product you purchased, we want to get you going back down the forward path. We want to reassure you that times are getting better by giving you our word we will fight for what you deserve. 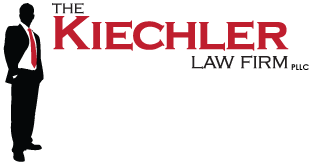 Let The Kiechler Law Firm take care of all your personal injury situations. Click on the links to the left to find out more information on each area.